Retired and pulling in $100+K a year at 55. Not a bad gig. Nothing like gov't jobs and their ridiculous pensions...regardless of job performance. I don't think it was so much companies as it was unions. The power of unions grew exponentially as the years progressed after WWI. It got to the point that a company couldn't operate without the blessing of the unions. I believe the 70's is when union power reached its peak. The slow turn back began with the Reagan presidency in the 80's, starting with his firing of air traffic controllers that went out on strike. As economies became more global, many unions were forced to, either cede power back to companies, or see their members companies forced into bankruptcy which, of course, would benefit no one. This is how you do your job. NYBF wrote: This is how you do your job. why the scare quotes on heroic? Don't think they're scare quotes. Think they're in quotes because the word was actually used to describe him. Damn proud of him. That’s the job they’re hired to do, but it’s awesome to see him save lives by endangering his own. Shooter has been arrested. No word on casualties or injuries yet. I kind of like the never giving out their names or anything about them in the new tactic more. Never give them an once of fame. "....and keep weapons out of the hands of people who are a harm to themselves or others..."
and his face is all over the web now. another white nationalist, nazi...what ever you want to call him. Polk County schools will ban all backpacks and put armed officers in every school for the remaining few days of the school year. Just another day in America....as usual, nothing will be done. Moving along on till the next one. Pistol (.38) and shotgun were the weapons according to Gov. Abbott. Neither are semi-automatic nor a rifle so I don't think this story will be propped by the gun confiscation folks in the media. The shooter being only 17 was obviously in illegal possession of them. Played football and was involved in some greek dance group (based on his name I assume he is of greek decent). Last edited by DreadNaught on Sat May 19, 2018 12:26 pm, edited 1 time in total. Mountaineer Buc wrote: "....and keep weapons out of the hands of people who are a harm to themselves or others..."
Exactly. Better yet, lets keep people from harming themselves and/or others, period.... regardless of the method and tool. Wonder if these numbers are legit. If so, it's an embarrassment to the United States. Let’s abolish high school and send everyone to the military .... it’s safer right? Seems like a NYBF type meme. According to the article that produced the meme there have only been 13 military deaths in 2018. 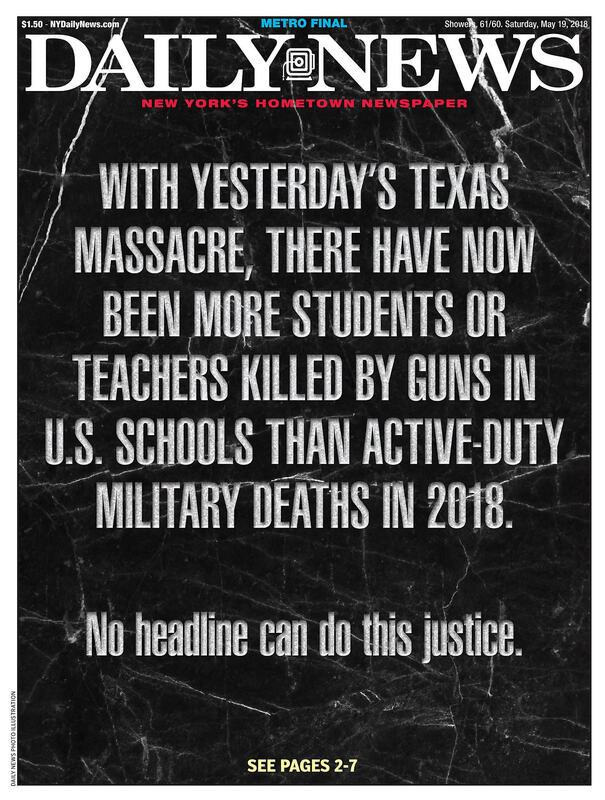 Soooo, we need to start training and arming all students and teachers? Got it. Why stop at making guns illegal? We should make it illegal to kill someone, that'll solve more than just gun deaths. Bunch of ****ing morons who don't know the difference between a meme and a newspaper. Can someone refute the numbers? Or nah? NYBF wrote: Bunch of ****ing morons who don't know the difference between a meme and a newspaper. Oh, shut the **** up moron. LOL @ "newspaper" Daily News isn't even a tabloid any longer. It's not meme, guys. It's from a news source. That's not a surprise since you can't have a thought unless it crosses your Facebook feed. This is the gofundme for the man with terminal cancer whose wife had to go back to work to pay for it and was murdered in school the other day. I'm not posting the link because I haven't had the time to check and see if it's legit. But imagine living in a country where people think **** like this is OK.